PE15-30 replaces model PE12-175 as a more powerful 7" variable speed angle polisher to cater to the ever growing concrete polishing needs. 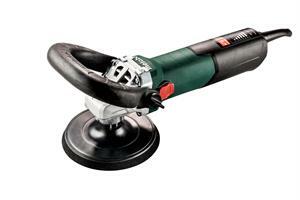 Metabo sanders and polishers are known for their superb surface finishing technology. Hardly any application places such varied demands on tool development than processing surfaces - whether it's rough or fine, even or curved, into tight corners or wide open areas. That is why Metabo offers a suitable tool for almost any special problem. When the tool matches the challenge, you get the desired result. Metabo. Work. Don't play. For backing pad up to maximum: 180 mm / 7 "